Recess often feels like a break for educators. After all, it provides a chance to step back and let kids do their thing. But . . . good things happen when adults actively engage on the playground. Interacting beyond the classroom improves relationships between students and adults. Kids are eager to play with their teachers and recess staff. Model play even when the activity isn’t your best game. When students see adults trying and failing, they get the message that it’s okay to make mistakes. Check in with kids not participating. Ask what game a student wants to play or why a student is unwilling to try a game. We never want to force students to play, but simple questions can help break down challenges students are having on the playground. Have a variety of games available. It takes planning to create a space for every student—including those with different skills, interests, and abilities—on the playground. The same goes for adults—if you’re not up for an athletic game, cheering kids on or turning the rope count as positive interactive play. Maintain a healthy level of competition. Introduce games where students can jump into a line to join. Games feel unwelcome when students have to ask to get in or when the play doesn’t pause for new kids to join. Choose games that give everyone a chance, like Three Lines Soccer or Foursquare. Just say “No” to captains. 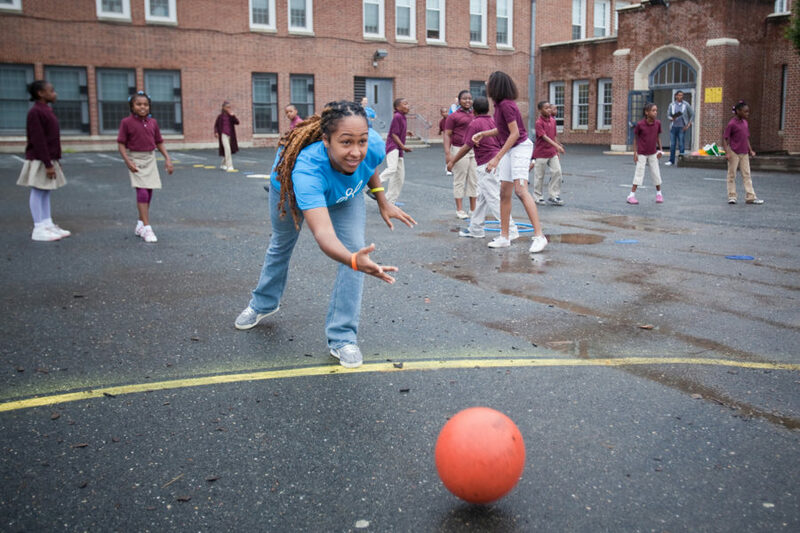 Ask your adult recess leaders to try out a new game. Share these tips with your adult recess staff and ask for feedback or other best practices based on their experience. Get aligned on roles and expectations for adults on the playground for every recess. See how one Los Angeles principal changed recess by getting adults to participate on the playground. Want to assess the health of your recess? Take the Recess Checkup—a three-minute, online quiz designed to help you identify strengths and uncover areas for improvement. *The Missing Piece, CASEL (Bridgeland, Bruce, Hariharen, 2013, p.22), The Impact of a Multi-Component Physical Activity Programme (Massey et al, 2017, p.9). Playground games encourage adult participation. Print out this guide for your Recess Team to make sure everyone feels welcome and included.